In an earlier post, Novelist who loved geography set a story in Mexico, which his publisher labeled South America, we referred to Mexico’s first international scientific expedition in 1874. This is the expedition that social historian William H. Beezley says was linked by many Mexican writers to Jules Verne’s fictional epic, Around the World in 80 Days, published the year before. (Mexican National Identity: memory, innuendo and popular culture). Beezley’s account has one significant error; he mistakenly writes that the international expedition was to observe an eclipse of the sun, when in fact its purpose was to make measurements during a transit of Venus across the Sun. Venus only transits the sun infrequently, but then usually does so twice in eight years. Mexico is not commonly associated with astronomy, despite the fact that archaeologists and archaeoastronomers have worked out that several indigenous groups including the Zapotec, Aztec and Maya all constructed astronomical observatories and were able to predict eclipses and other events in the skies with incredible precision. Perhaps even more remarkably, an international astronomical congress appears to have been held in Xochicalco in the 8th century BC. Obtaining an accurate figure for the astronomical constant was one of the greatest challenges for astronomers of the time. In 1760, a French astronomer set out for India (for the 1761 transit) but failed to arrive in time! Undeterred, he remained in India, waiting patiently for 1769. Alas, on that occasion it was too cloudy to make any worthwhile observations. Mexico’s connection to the astronomical constant began at this time. For the 1769 transit, Spain had granted permission to another French astronomer to join a party of Spanish astronomers setting up a temporary observatory near San José del Cabo on the southern tip of the Baja California peninsula. A short distance away, a creole astronomer Joaquín Velázquez de León had traveled from Mexico City to make independent observations. 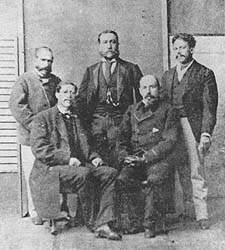 Only days after the transit, three members of the Franco-Spanish party, including the two principal astronomers, died of yellow fever. By the time of the next transit in 1874, large scientific teams had been assembled by several countries including France, Russia, Germany and the USA to collect better data for a more accurate calculation of the astronomical constant. Francisco Díaz Covarrubias (the expedition’s leader) who had written various books and had installed the first post-Independence astronomy observatory in Chapultepec Castle, Mexico City, in 1863. Francisco Jiménez – whose offical qualification was as a “geographic engineer”. He had fought in defense of Chapultepec Castle when the USA invaded in 1847, written about the 1769 transit, and been a key member of the Mexican Border Commission which fixed the definitive Mexico-USA boundary in 1856. He helped coordinate research for the great map of Mexico produced by Antonio García Cubas. Jiménez was the first person to use telegraph signals to determine longitudes in Mexico with precision. Francisco Bulnes was the expedition’s chronicler and the youngest member of the team. Agustín Barroso had wide interests in natural science and engineering, and became an early enthusiast of photogaphy and its applications to astronomy. He was responsible for the outstanding sequence of photos of the transit of Venus taken as part of the Mexican scientific expedition’s work. Manuel Fernández Leal was an expert surveyor and educator who had also participated on the Mexican Border Commission. The team traveled to Japan and were able to make valuable measurements. Commendably, they published their first results very much more quickly than did the astronomers from all other countries.